How much do you know about your spleen? Here are some weird and wacky facts that might have you thanking your spleen for what it does. 10% of people have an extra, tiny spleen next to their regularly-sized one, and it's considered normal. Splenomegaly is the technical name for an enlarged spleen. Where the spleen hangs out: Under the left side of your ribcage. Spleens are actually more purple than red (and they're definitely not green)! Spleens do not regenerate, but livers can! The spleen also gets rid of old red blood cells. Here's how: when blood cells get old, they get stiff; the spleen has tiny channels called blood capillaries. These are too small for old, stiff blood cells to get through, so they get caught. 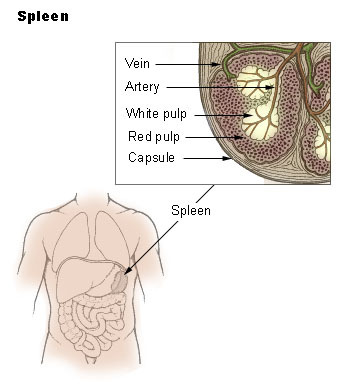 Then the white blood cells in the spleen break down the old red blood cells. Know any more cool facts about spleens? Comment below!